Treasures sometimes fall from the sky, and auction galleries are happy to sell pieces from airship disasters like the Hindenburg, World War II airplanes, mementos of space flights like moon dust, and even pieces of a meteorite. A man in Grand Rapids, Michigan, bought a farm in 1988 and there was a large, unusual rock in the barn being used as a doorstop. The previous owner told him it was a meteorite that had fallen on the property back in the 1930s. Years later, the man read about a shard found after a meteorite sighting near Detroit in January 2018 that sold for thousands of dollars. He took his rock to Central Michigan University where an excited science professor identified it as a 22 1/2-pound space rock from a meteor that had indeed fallen sometime in the 1930s. 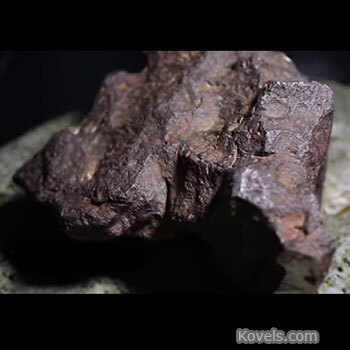 It is the sixth largest of 12 meteorites found in Michigan. It should sell for thousands of dollars. Interesting - but not the first valuable rock used as a doorstop. Ca.1800 in No. Carolina someone pulled a large rock with shiny speckles out of riverbed and it was used as a decorative doorstop for years. When the owner did figure out what it was and took it for evaluation - it started the 1st gold rush in the U.S. I read your article on the meteorite doorstop. It was interesting especially since I have found a piece that looks like that Michigan meteorite and rings up on my metal detector. It's very dense. I thought it might have some gold in it. I'll let you know what I find out about it. I have a larger meteorite that looks very much like this. I live in Oregon. Where would I go to get my rock looked at by an authoritative advisor.